This FJ40 project represents the fulfillment of two dreams - a father who passed on his knowledge and passion for classic cars, and a son who brought his father’s legacy full circle, with the commission and design of this very personal custom build. Inspired by a Tonka® truck the client had as a child, and custom-built for more grown-up pursuits, this family-friendly FJ40 is ready for just about anything. 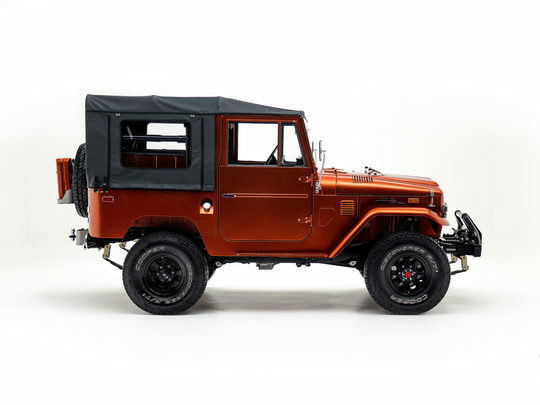 This FJ40’s one-of-a-kind design draws heavily from the world of custom hot rods, toy trucks, and Land Cruisers of yore. After we completed our frame-off Land Cruiser restoration, the client hand-picked classic features from different eras to create his own custom design - a look that’s amplified by an array of custom touches - hot rod-inspired paint, Mickey Thompson (M/T) wheels, Cooper Discoverer A/T3 tires and a body-colored jerry can. And, of course, we can’t forget our favorite feature, the bottle opener on the custom front bumper - perfect for hot summer days. This FJ40 wasn’t equipped with its original engine, which gave us the license to go all out and fully modernize the driving experience. We rebuilt the Toyota 3F-E engine and paired it with a 5-speed manual transmission. Add in the Old Man Emu suspension and power steering, and you get a willing and able commuter - one that’s equipped to handle rough roads and the joys of parallel parking. Inside, you’ll find a cabin that’s made for kids and dogs, commutes and camping. Raptor bed liner adds a super-tough coating to the floor, preventing scuffs and scratches, while the marine-grade audio system keeps the tunes coming, even in wet conditions. Cabin comfort is further enhanced with the Vintage Air A/C and heated Corbeau Sport Seats with black vinyl trim. One of the things we take pride in at The FJ Company is fulfilling the dreams of lifelong auto enthusiasts. People who love cars and have gotten their hands dirty tinkering with a few projects of their own. It was our pleasure to assist our client with this build - one we know he will enjoy for years to come.